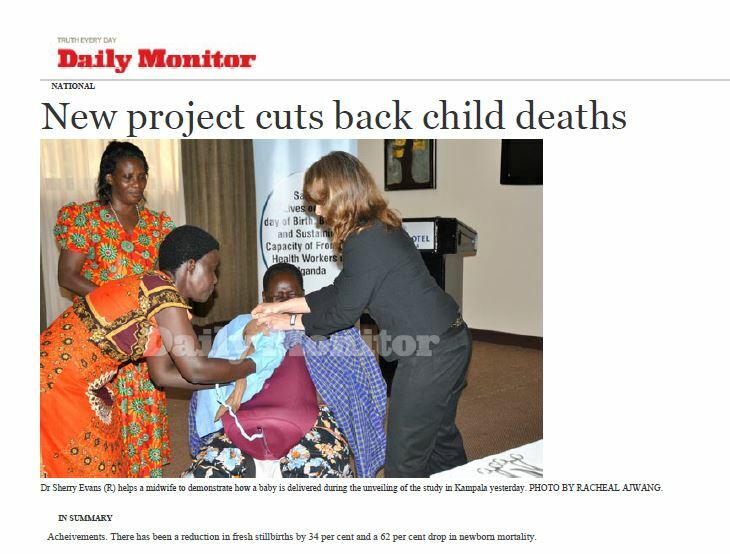 Ugandan newspaper features Jhpiego-led low-dose, high frequency training approach. Kampala, Uganda—Building the skills of health care providers through an innovative low-dose, high-frequency training approach led to significant reductions in birth complications and newborn deaths, an assessment of the Saving Lives on the Day of Birth project shows. The results of the Saving Lives on the Day of Birth: Building and Sustaining Capacity of Frontline Health Workers in Uganda assessment were unveiled at an April 19 meeting of representatives of Uganda’s Ministry of Health (MOH), partner organizations, researchers and donors. With support from the Saving Lives at Birth consortium, Jhpiego, in conjunction with PREFA, the American Academy of Pediatrics, and the MOH, trained health workers in 12 districts at their hospitals and health centers to reduce maternal and newborn deaths using the Helping Mothers Survive Bleeding after Birth and Helping Babies Breathe training programs, which feature humanistic models. Jhpiego assessed provider performance and health outcomes after these trainings and shared results with district-level stakeholders, including district health teams, facility in-charges, health workers and senior district leaders. While the project had many achievements, some of the most notable are that 602 health care providers were trained, and that not only did they reduce postpartum hemorrhage by 17% and retained placenta by 47%, but, as a result of their improved skills, there was also a 34% reduction in fresh stillbirths and 62% reduction in newborn mortality within 24 hours. In one of the many heartwarming stories from this project, study staff were present at a health center when a woman delivered triplets, each of whom required help to breathe. Because of the equipment and training, two midwives successfully used resuscitators to assist all three newborns. By directly observing care provided to women at birth, the assessment compared the performance of skills before and after the training and related practice. After an additional nine-month period with no training or practice, more births were observed to see if skills were retained. The assessment found that many skills, such as preparing essential items before birth and providing an essential drug within one minute of birth to prevent hemorrhage, were retained and that many providers actively continued to improve. In addition, providers who were not present on the training day also showed improved skills, suggesting a culture change had occurred within the facilities. Jhpiego and partners achieved these results by building frontline health worker capacity using a low-dose, high-frequency training model. Traditional training approaches that focus on extended, off-site, group-based workshops have shown limited effectiveness in improving and maintaining provider performance after training. New evidence identifies better ways to optimize sustained improvements in service delivery. These include using interactive techniques that engage the learner, providing opportunities for simulated practice, offering constructive feedback and planning and delivering learning opportunities at an appropriate dose and frequency at the health facility. Brief practice sessions for several weeks after training further helped health workers retain their new skills. Jhpiego is already building upon its success in Uganda by testing the next Helping Mothers Survive package in Kampala and Mbale. The new module addresses pre-eclampsia and eclampsia—a pregnancy-related hypertensive disorder that can prove fatal to both women and their unborn children. The goal of this low-dose, high-frequency module is to further enhance the skills and abilities of frontline health workers to provide quality care to Ugandan women to decrease related mortality among mothers and babies.